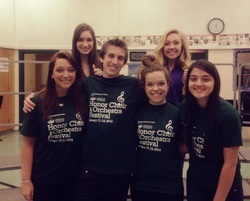 OHIO UNIVERSITY – Several elite vocalists from the Northridge High School Vocalise class were selected to participate in the Ohio Honors Choir, a state-wide group of students selected to train and perform at Ohio University in Athens, Ohio. The three-day event took place over the weekend of January 17th, 2014. The members selected spent a grueling three days training, rehearsing, and performing their songs at the First United Methodist Church and the Memorial Auditorium. The students who went on this trip were Leyna Varney (’16), Kaelin Curran (’16), Trisha McConnell (’16), Cayleigh Kerns (’14), Kayla Jasper (’15), and Jesse Kanavel (’14). The students were nominated by Choir Director Jessica Weiss, who got the information on the event and nominated students she saw fit. Students who went last year were invited back. The events of the weekend included personal training with the OU Voice faculty, a performance at the First United Methodist Church in Athens, and a reception and festival concert at the Memorial Auditorium, in addition to hours upon hours of training and rehearsals. The students had five college-level pieces to learn and perform in three days, a monumental task that Weiss believed they could handle. “It is different than in our class. Here, there are so few students that they have to sing all-out all the time." “I was very excited,” says Curran. “It was great to go and meet so many other people who shared similar talents and interests.” Curran, a sophomore, has been involved in the high school music scene since her freshman year. Mat Scott (’15) is the News Editor and Web Designer for The Viking Vault. NORTHRIDGE – Board members gave a unanimous thumbs up to the formation of a high school girls’ lacrosse team at their Jan. 21 regular board meeting. Kathy Trimble and her daughter, Haley (’16), first proposed the team in December after verifying there was enough interest to field a team. There have been at least 20 girls who have already signed up in the office to play. “A lot of girls who have not played a sport in years are excited to play lacrosse since they will be coming into the game on an equal playing field as the other, more athletic girls,” said Kathy Trimble. Trimble made clear that girls’ lacrosse is much less violent than boy’s lacrosse, so these girls are less likely to be injured. She also stated that the girls’ lacrosse team will give the school greater publicity since our small school is introducing such an uncommon sport. In other business, the board briefly explored options for backing the start time of school up next year, from 7:30 to 8 a.m. The concept was first proposed last month by Matthew Hebert (’15). Ultimately, concerns about the expense of an additional bus to get Northridge students to C-TEC on time seemed to carry more weight than the advantage of students and staff sleeping in later. The board also expressed concerns on whether a later start time would negatively affect teachers’ child care plans. “The other proposals by the eleventh graders are still being followed up on,” Superintendent, Dr. Chris Briggs said. He deemed that he was especially interested in the coffee shop concept proposed by Shanlee Lamp (’15), Faith Miller (’15), and Joy Goodman (’15). The board is currently looking further into the feasibility of the juniors’ proposals and will give more information on the topic during the following meeting. Middle school principal Sherry Birchem gave an update on the growth of the middle school. She announced that the middle school is considering forming an archery team and a book club. She also described how middle school students created short videos to express their new Character Counts program, W.A.V.E. (Warriors Asserting Values Everyday). "I’m excited about the level of excitement and leadership the kids were showing,” smiled Birchem. The students are going to be rewarded for good character behavior with prizes such as Columbus Clippers and Blue Jackets tickets, school supplies, and front-of-the-lunch-line passes. Most of the board meeting centered on the newly proposed levy renewal. See related story by Savannah Legg. The board will meet again in regular session on Tuesday, Feb. 18 at 6:30 p.m. in the media center. NORTHRIDGE - High school cheerleaders and high school boys came together for the big Halftime show Friday February 7th. At halftime of the varsity boys’ basketball game against Licking Valley there was a six minute dance that the cheerleaders and fellow classmates put together. “It’s the last hoorah for the class of 2014” says senior cheerleader Sierra Sullivan. Thirty people total are doing it and it includes partner dances, girl stunts, boy and girl stunts, cheers, basket tosses, and a big senior stunt. The expectations of this year’s halftime show were high, as cheerleader Haley Menix ('14) said, “We want to top last year's.” The guys wore customized shirts that say "Northridge halftime show" on the front and "don’t drop that 'stunt stunt stunt'" on the back. See the "Extras" page for a video of the show. Hunter Adkins ('15) is a Staff Writer and Sports/Extras Editor for The Viking Vault. NORTHRIDGE- There is a new currency that has been getting plenty of attention recently, and people won’t be able to touch it. Literally. Bitcoin is a currency that is all online. You can get your digital hands on a Bitcoin by downloading a software online and leaving your computer to ‘mine’ the coins. At last check, one Bitcoin had a price of 849.2 US dollars, so people have been making some good money from trading Bitcoins like stock. 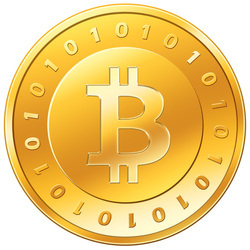 Bitcoins came into play on January 3rd , 2009 as open source software from creator Satoshi Nakamato. It’s a crypto-currency, so it uses cryptography to control the creation and transfer of money between people. When Bitcoin first started in 2009, it was worth almost nothing. Then, about a year or two later, people who purchased Bitcoin for mere dollars and cents later realized that their small investment turned into hundreds or thousands of dollars. Kristoffer Koch invested about 27 US dollars in 2009 and forgot about them until April 2013, when he went to look at his Bitcoin balance he saw $886,000. There are tons of Bitcoin stories like that all over the world. Many people who invested in Bitcoin in the very early stages are now extremely wealthy and many new types of Bitcoin have surfaced. Bitcoin is a crypto-currency, so anyone can take the software for Bitcoin and tweak it for any of their needs. A few new types of the coin are Litecoins, which offer faster transactions, Anoncoins, which are designed to be more anonymous, and Stablecoins, which offers ‘military-grade protection’. Those are just the coins that have based their currency off of what Bitcoin started with. There are new crypto-currencies appearing all the time like Devcoins for independent developers and Coinye Wests for music and concerts. Those are just a few of many electronic currencies popping up every now and then. As of right now, there are around 70 crypto-currencies being bought and sold in decent quantities. Bitcoin is currently gaining popularity, and its cost is going up more than down. Bitcoins are currently being accepted on sites like Overstock.com, Zynga, and Virgin Galactic as reliable currency. Financial experts believe that Bitcoin is going to become the primary way of purchasing products on the internet. Those are just some of the online merchants that accept Bitcoin. Some Argentinians use Bitcoin instead of their official currency due to inflation and many shops around the world accept them as well. But Bitcoin’s value is intrinsic, which means that a government isn’t backing the coins and that much of its value is based off of the willingness of people to notice Bitcoin’s worth and spend them on goods, services, or other currency. There have been many other crypto-currencies that have tried what Bitcoin has accomplished and have failed, so far Bitcoin is doing fairly well for itself. The idea of electronic currency is very optimistic one. The currency you use can be active and conscious and can be used for exactly what you need. You could give your child some money and sort of ‘secure’ it so that they can only spend it on certain things. Bitcoins have a certain potential that its predecessors didn’t and whatever it is, it seems to be working. NORTHRIDGE- Step into the halls and see the students walking through the school, hear the chatter of teenagers lollygagging with their peers. It's a festive, upbeat scene. But, what is that smell? The halls of the school have quite the odor, not every day, but occasionally enough to make Vikings pause as they go about their business. On these days, the aroma has students and staff wondering what could be the cause of this noxious smell that is overwhelming your nose? Some blame the freshman, partly because it is easy to blame everything yucky on freshmen and partly because the smell is sometimes most prevalent in the freshman hallway. Others just assume it is the natural musk of the school itself, while a few fortunate souls say they don’t smell a thing! So we went to find the answer to the “stinking” problem. We asked Maintenance Supervisor Mr. Dave Liggett what was the root of it all, and he said there are potentially two distinct and unpleasant smells at work on those random, smelly school days. Bad Smell #1 (which Liggett calls the “stinky sock smell”) occurs on days that start out cold and then warm up. When the system switches from heat to cool mode, the transfer picks up the scent of the lint in the coils. “This smell doesn’t last long,” Liggett explained. Bad Smell #2 is described as a “sulfur smell.” It is caused by a southwest wind strong enough to carry the aroma from the kitchen grease trap outside the middle school art room into the intake for fresh air. This intake is located directly above the freshman hallway. So there you have it, what the smell of the hallways at Northridge really is. So before you blame the freshman for stinking up the halls, remember, they (probably) aren’t the biggest reason for the stench. NORTHRIDGE - A Northridge renewal tax levy is heading to the ballot this May. After much deliberation during their Jan. 21 meeting, Northridge School Board members voted 3 to 1 to place the levy on the ballet this coming May. The levy that is to be voted on by the public is a renewal levy, with no additional property tax for district residents. The levy is a renewal levy, meaning that there will be a 0% tax increase. If approved by voters, the renewal levy will keep the district solvent for a period of five years. Teachers, classrooms, and student supplies will have a new $2.1 million budget if this 0% tax increase renewal levy is voted into effect in May. The current supply fund for Northridge High School has reached a low of $8,000. If this additional money is added to the funds, Superintendent Dr. Chris Briggs feels that “very few districts will be as financially stable as us if this passes." Briggs also stated that the money will create “more initiatives, and more opportunities for students." Britt Lewis, Treasurer of Northridge schools, stated at the board meeting that “If this levy does not pass, the school will be put in a state of physical emergency in a year and a half. But if the levy does pass, we will strongly be able to maintain." Briggs and the rest of the school board are planning on getting students at Northridge who are old enough to vote registered by the May ballot so they are able to vote for the levy. The school board also encourages students to help get this renewal levy passed by being informed about what the levy does for the schools and for themselves. Savannah Legg ('16) is a Staff Writer for The Viking Vault.